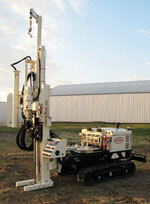 The Model 7822DT subsurface machine from Geoprobe Systems has direct push functions and geotechnical capabilities. Features include a GH64 hammer with modular percussion power cell technology and integrated two-speed bidirectional rotation. The rear stabilizer contains a drop rack system, which allows operators to move accessories and tools weighing up to 2,000 lbs. Three auxiliary hydraulic power ports can be controlled by an operator via the control panel.